A gothic punk long sleeved T-shirt top made from black stretch cotton. 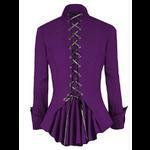 The top has a decorative corset panel at the centre front with a lined mesh vest underneath and corset lacing on the shoulders. The sleeves have a chiffon cuff and the top has an integral choker attaching to the front neckline. 65% cotton, 35% polyester, cotton lining. Hand wash at 30 degrees C.
Bust: 30" unstretched Length: 23"
Bust: 32" unstretched Length: 23"
Bust: 34" unstretched Length: 23"